I always felt that if I could grow mushrooms outdoors among my garden plants, I would have a fully functioning little ecosystem even here in the desert. This year, I finally achieved exactly that, and it’s one of the highlights of my gardening year. I should add that anybody who gardens is growing all kinds of soil fungi, but I wanted the edible kind. Three species came through for me. 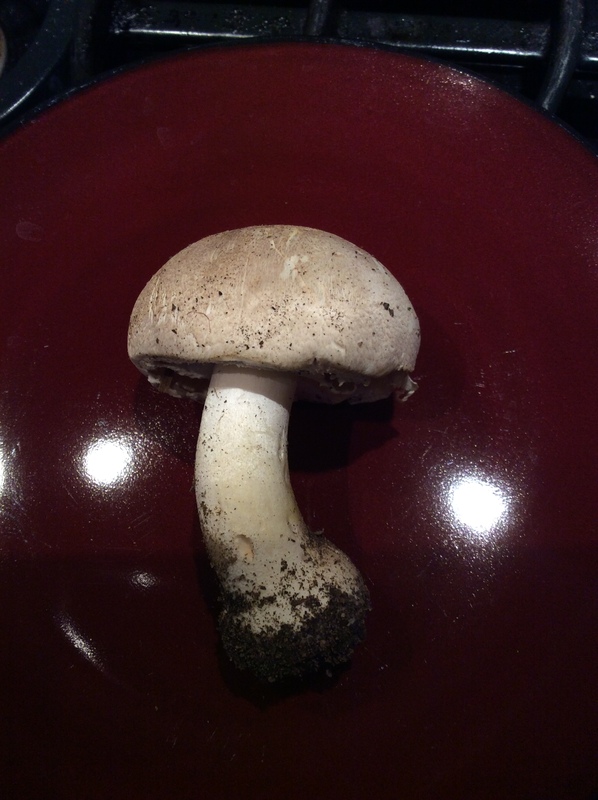 The first was the almond agaricus, shown above. They are compost lovers, and I buried chunks of the spawn in a bed of compost that I was about to plant squash into. Unfortunately, the squash overran the bed and I only got a few mushrooms from around the edges, but they were very delicious. This species really does have an intense flavor of almonds, and if you don’t love almonds you probably won’t want this mushroom, but if you do it is a special treat sautéed in butter and served alongside a nutty beefy piece of dry aged meat. 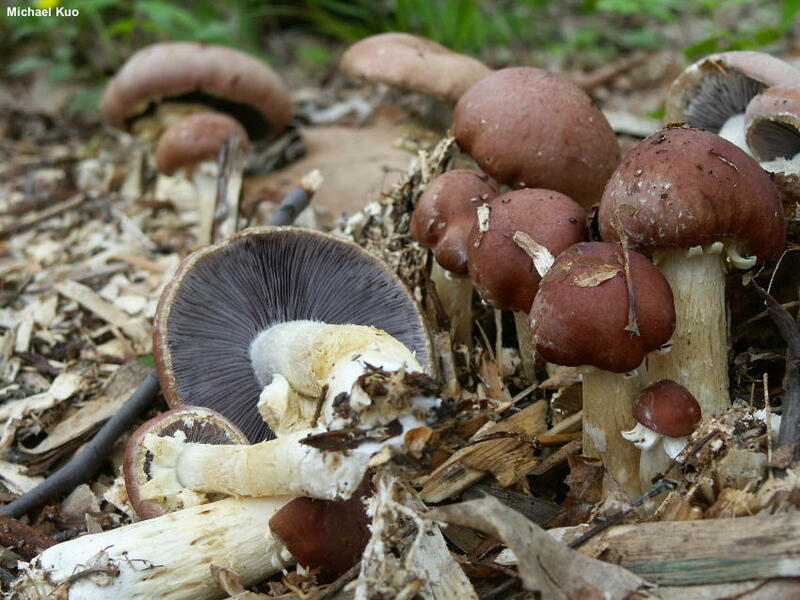 Stropharia rugosa-annulata, the wine-cap mushroom, grows freely in mulched garden paths. It will grow in pure straw mulch, and that is how I grew it at first, but there is no question that it tastes better if you incorporate some hardwood chips or sawdust in with the straw. 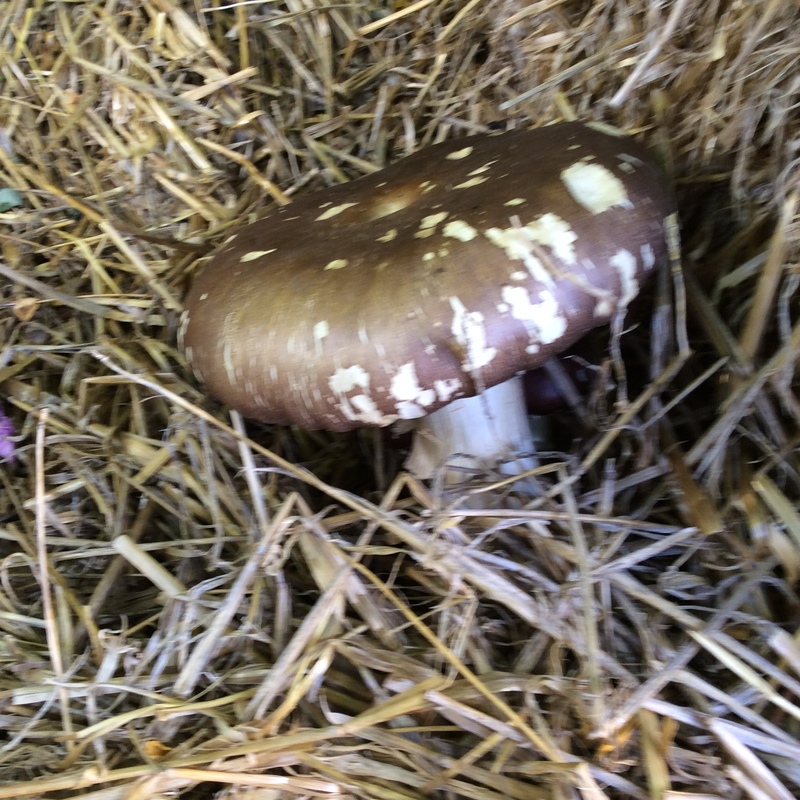 Even when grown in straw alone it tastes as good as a store-bought cremini or better, but once I incorporated some hardwood it became a treat. The picture above shows how it should ideally look at harvest. The button stage, shown to the right, is tastiest but I can never resist letting one or two get huge. The picture below shows how it is more likely to look in my garden, because for some reason there are tiny little slugs that only seem to chew on this one mushroom species. But no problem, I just brush them off, and once it is washed and sautéed in butter you can’t tell that they were ever there. 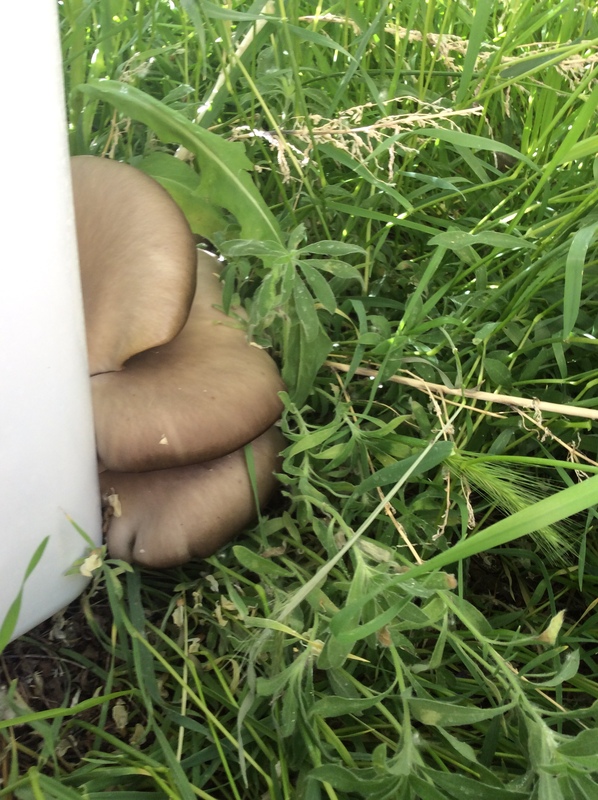 Then there are oyster mushrooms, my favorite cultivated mushroom to eat and one of the easiest to grow. I grow them in the shade in almost whatever receptacle comes to hand, usually laundry baskets lined with clear plastic bags. For the growing medium I use a mixture of straw and hardwood sawdust, sterilized sufficiently with hydrogen peroxide solution, with a little alfalfa shake included to nourish the mushrooms. I stick the whole rig under a dense shade tree in late spring, in an area where water from the sprinkler will hit it when I water, but I don’t make any other effort to keep it wet. I like to let oyster mushrooms get big, to the point that they are really meaty. After cleaning them and cutting away the tough stem area I slice them in quarter inch strips and sauté them in olive oil with salt until they have some nice brown spots, adding a little chopped garlic toward the end of the cooking. They are more tender when small, but not nearly as umami and tasty. It’s the difference between veal and beef, and I have never been a fan of veal. Of course, if you want a milder flavor and softer texture, pick them smaller. Today I finished “planting” several baskets and bags with the blue oyster mushroom, a subspecies of the common oyster mushroom that fruits at a lower temperature. They are going in an unheated shed, and might fruit during the winter. Remains to be seen if this will work, but anything that prolongs the mushroom season is worth a try. 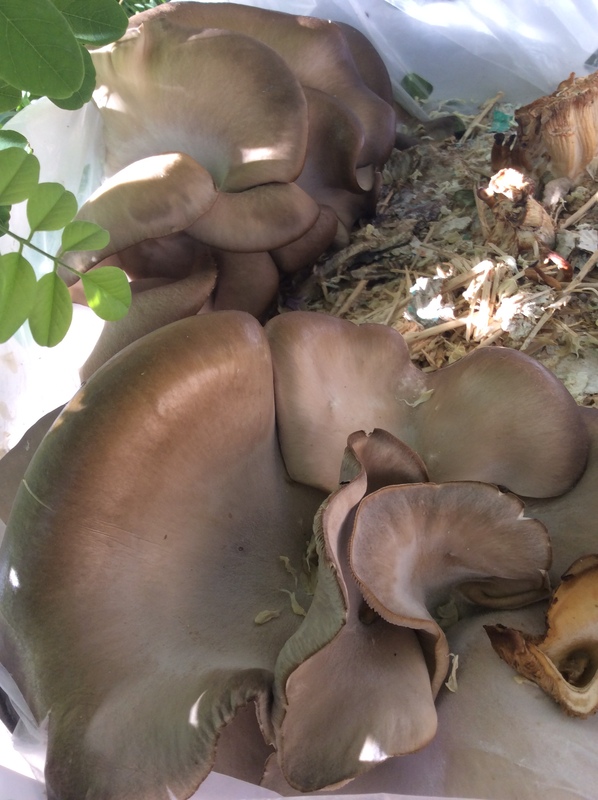 Oyster mushrooms are determined to grow. Recently I broke up a spent basket and put the mycelium in lumps under straw mulch, and today I found tiny infant oyster mushrooms poking out. I threw a frost blanket over the area and weighted it down with pavers, and maybe I’ll get a late outdoor crop. Nothing fills me with quite as much satisfaction as seeing one of my mushroom projects cooked and on the table. I am not sure why this is, except that their biology is so unique and fascinating and they are so essential, in one form or another, to life on earth. They have some interesting medicinal qualities, but I don’t feel any great need for medicine and prefer to eat them because they are fascinating and delicious. I’m enjoying a book called Radical Mycology, which is a compendium of nearly everything that you can imagine about mushrooms, including a heap of medical advice which, in my opinion, should be taken with a very large grain of salt. But it is addictive reading and will get you through many a long winter evening and give you ideas for new projects.